Haller Nutt was best known for ambitious architectural plans for a Natchez house that was never finished. Nutt was born on 17 February 1816 at Laurel Hill Plantation in Jefferson County, Mississippi. He was one of seven children born to Dr. Rushworth Nutt, developer of Petit Gulf cotton, a rot-resistant strain, and his second wife, Eliza Ker Nutt. Haller Nutt is often erroneously referred to as “Dr.,” and while he did attend the University of Virginia from 1832 to 1835, he earned neither a medical nor a doctoral degree but instead earned a fortune in sugar and cotton. Following in his father’s footsteps, Haller Nutt developed a successful hybrid cotton strain, Egypto-Mexican, and by 1860 his plantations in Louisiana and Mississippi covered 42,947 acres and required the labor of eight hundred slaves. While his vast fortune topped three million dollars before the outbreak of the Civil War, he amassed an enormous amount of debt prior to his death in 1864. His unfinished home, Longwood, came to be known as Nutt’s Folly, a symbol of his financial fall. Haller Nutt married Julia Augusta Williams of Natchez in 1840 at Evergreen Plantation in Louisiana, and they went on to have eleven children, some of whom did not survive to adulthood. Julia Nutt had always been fond of Natchez and was the inspiration behind her husband’s 18 September 1850 purchase of Longwood Plantation, located on eighty-six acres two miles south of Natchez in Adams County. On 24 December 1859 Nutt wrote to Pennsylvania architect Samuel Sloan to express an interest in building an octagonal house (a popular midcentury design) at Longwood. Sloan completed plans in April 1860, and construction began shortly thereafter. 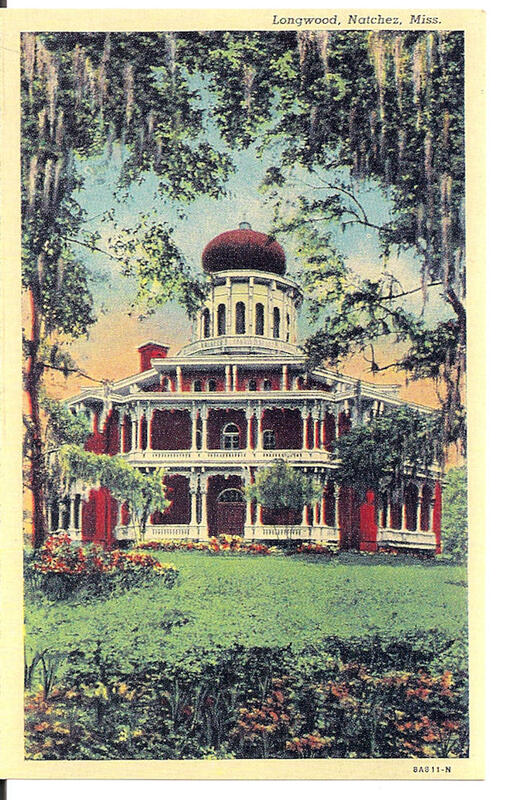 The arabesque design included thirty-two rooms, eight verandas, four porches, 115 doors, twenty-six fireplaces, twenty-four closets, and a rotunda that opened to a Moorish cupola. Each floor was to have at its center an eight-sided room with eight doors leading to eight outer sections. The 30,000-square-foot structure measured 104 feet across and is the largest octagonal house in America. Excluding the costs of land and furnishings, building supplies totaled twenty-eight thousand dollars. Unique to Longwood were Sloan’s plans to harness indirect lighting through the use of mirrors and a progressive fireplace venting system. The final drawings for Longwood were published in 1861 in Homestead Architecture as “Design I—Oriental Villa.” That same year the exterior and nine rooms on the basement level were completed. However, construction halted in April when the Civil War broke out, and the first through third floors remain a “vast, empty, and unfinished shell.” The Nutt family moved into the basement—the only finished living space—and Haller Nutt resided there until his death from pneumonia on 15 June 1864. Julia Nutt resided at Longwood until her death in 1897. Ownership of Longwood remained with members of the Nutt family until 1968, when it was purchased by the Pilgrimage Garden Club of Natchez, which now operates it as a museum and offers tours. On 16 December 1969 Longwood was designated a National Historic Landmark and added to the National Register of Historic Places. Five of the original plantation outbuildings still stand: the necessary (privy), kitchen, slave quarters, stables, and carriage house.